Capture the textures, form and details of organic objects with confidence! 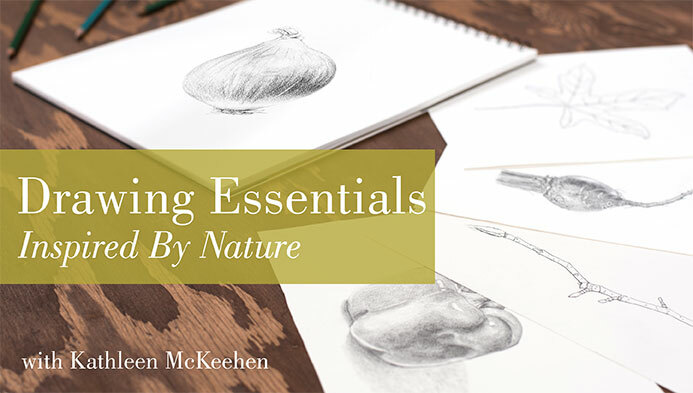 Find out how to draw plants with lessons from botanical artist Kathleen McKeehen. Start by applying simple measurement and transfer methods to draw a deeply detailed leaf. Next, illustrate a mushroom while you discover how to depict round objects with accurate perspective and form. Learn to mimic the play of light on a round form as you draw an onion. Then, build valuable shading skills as you sketch a smooth, shiny bell pepper. Layer realistic surface textures while using crosshatching, stippling and continuous tone shading to recreate a beet's rough skin. Plus, render a rose petal with delicate form and shading — so drawing a finely detailed flower isn't daunting.